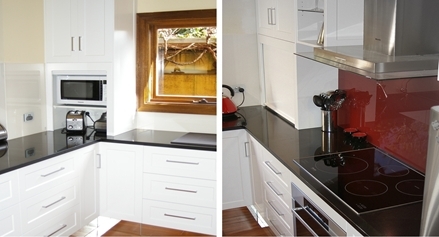 Kitchen Renovation with Satin Shaker Panels with Absolute Black Granite tops. 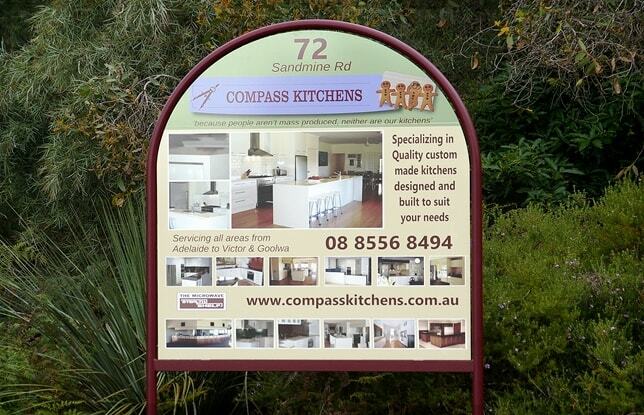 This is a Kitchen renovation that we did for our clients at McLaren Vale. Their beautiful home is one of the first homesteads built in this area; being built in the late 1800's. Our clients had recently purchased the property which had an existing old kitchen made in the Old Farmhouse Style, where however our client preferred to have something with a more modern feel but still suit the homes Architecture. 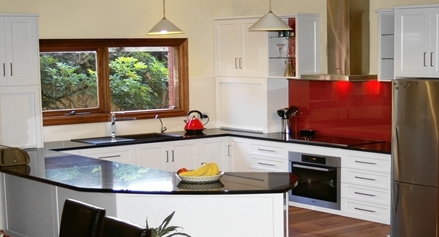 With this requirement we suggested the use of a Transitional Style Kitchen; where this style blends together the features of Traditional Style kitchens and those of Contemporary Styling features which would be a tribute to this beautiful old home. 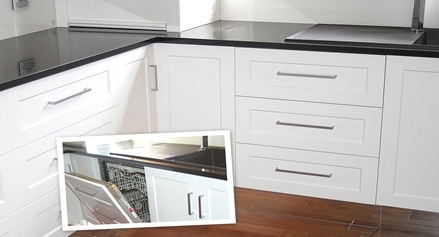 This style traditionally uses simple Shaker style doors and panels finished with a modern Satin Two Pack finish and blended with modern Appliances, Range hoods, and sink styles. For this project our client selected 30mm Granite bench tops in Absolute Black and asked us that we make these in one piece without joins with a wide peninsula that angled, as well as having a long sweeping curve on the seating side. In addition to the style of this kitchen, our client requested that the cabinets had the appearance that they were floating above the floor. For this our client requested that the bases be made of Mirrored glass that would reflect the new Jarrah timber floor; giving the appearance that this flooring cleared the cabinets and continued through underneath. 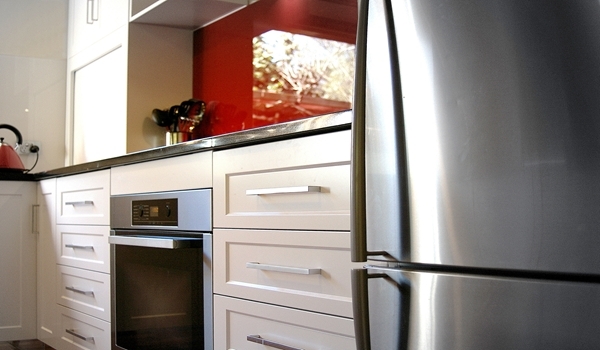 Our client had also wished to introduce some colour into the room, complimenting the redwood flooring and selected a feature glass Splashback wall in Pillar Box Red and continued this scheme by red back panels inside the open shelf cabinets that flanked the Stainless Steel Canopy Range Hood. 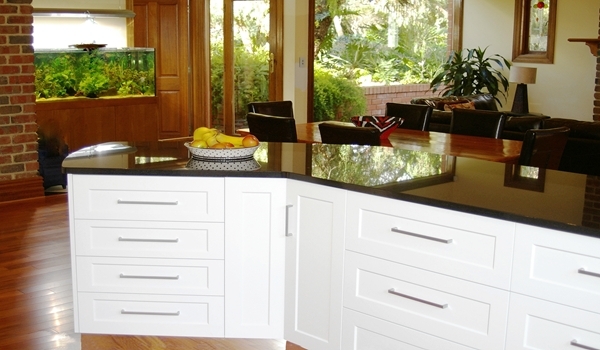 In keeping with this Transitional Style Kitchen, our client chose an Abbey Black Granite inset sink and Cube Mixer tap. We also installed a Miele Fully Integrated dishwasher, which we set up with drawer front panels to best conceal it, likewise we also made provision to install the Microwave inside the Appliance Cupboard and this sitting above the storage of the toaster, blender and other appliances, providing easy access, but also being able to close this from view. 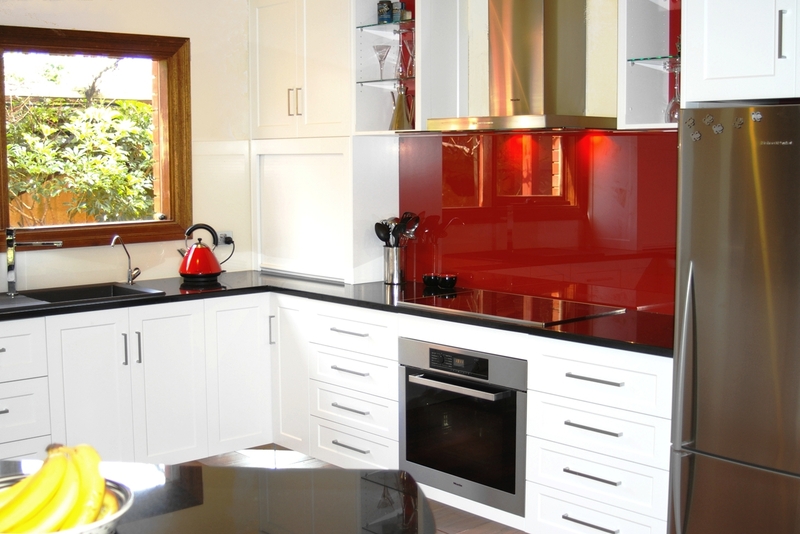 We finished this Transitional Style Kitchen renovation off with the use of beautiful modern, easy to clean toughened glass Splashbacks where our client used the Red for the feature wall and a light Eggshell for all the other splashbacks where we ensured this colour was not distorted, by using quality highly translucent Opti-Clear Glass.